Per his military service record (Depot), Michael Gleeson was born at South Melbourne, Victoria. He gave his age as 42 years and 4 months, his marital status as single, and his occupation as labourer. His description on his Certificate of Medical Examination was height 5 feet 7 inches tall, weight 151 lbs., with a medium complexion, blue eyes, and brown hair. His religious denomination was Roman Catholic. He claimed that he had no previous military service. His next of kin on his Attestation paper was listed as his sister, Mrs Julia Kreiger, 38 Mountain Street, South Melbourne. Michael Gleeson was named in an article titled ‘Blayney recruits’ in The Leader as one of six men who have joined ‘as a result of the visit of the Coo-ees to Blayney’. He completed his medical examination at Blayney on 26th October 1915, and was attested by Captain A. C. Eade that same day at Blayney. The Coo-ees had held a recruiting meeting, and stayed overnight at Blayney on 26th October 1915. On 2nd December 1915 Private Gleeson was charged for being absent from parade without leave. On 3rd December 1915 he was charged with being under the influence of liquor in company lines. He then went absent without leave until 9 a.m. on 13th December 1915. He was recommended to be discharged. On 14th December 1915 he was discharged from the A.I.F. not likely to become an efficient soldier. Per his military service record (5222), Clarence William Stewart was born at Hargraves, N.S.W. He gave his age as 21 years, his marital status as single, and his occupation as labourer. His description on his Certificate of medical examination was height 5 feet 6 inches tall, weight 151 lbs, with a fair complexion, brown eyes, and brown hair. His religious denomination was Roman Catholic. His next of kin on his Attestation paper was recorded as his mother, Mrs Mary Stewart, Hargraves, N.S.W. He completed his medical examination at Wellington on 25th October 1915, (7 days after the Coo-ees had left that town), then travelled to Blayney to catch up with the Coo-ees. He was attested by Captain Eade at Blayney on 26th October 1915. He claimed to have no previous military experience. ‘C. W. Stewart’ was named in the Bathurst Times as one of the Wellington recruits that joined the Coo-ees at Blayney on 26th October 1915. On 2nd February 1916 Private Stewart was charged with being absent without leave for 6 days. He was fined 30 shillings. On 7th February 1916 Private Stewart was charged with being absent from special picquet. He was fined 10 shillings. On 22nd February 1916 Private Stewart was charged with being absent from parade. He was fined 5 shillings. His mother sent a letter dated 29th March 1916 requesting her underage son be discharged from the A.I.F., in which she stated: ‘’In reference to my son Clarrie … I now find it my absolute duty to ask you, please, to discharge him at once as it is a case of necessity I cannot allow him to stay in any longer. If at any time when he is twenty one, he has the same patriotic feelings, he may, with my consent, re-enlist”. A copy of his birth certificate was also provided, dated 28th March 1916, which showed that his date of birth was 17th October 1897. Clarence William Stewart therefore had only been 18 years and 9 days old when he enlisted on 26th October 1915 (and not 21 years of age as stated on his Attestation paper). On 7th April 1916 Private Stewart was discharged at his mother’s request. NAA: B2455, STEWART C W, letter to O.C., A Company, 13 Battalion, from M. Stewart, 29 March 1916. NAA: B2455, STEWART C W, Birth Certificate. Per his military service record (regimental no. 4771), George Elsie Ewens was born at Mandurama, N.S.W. (His name is listed in some sections of his service record as George Leslie Ewens). He gave his age as 24 years and 3 months, his marital status as single, and his occupation as farmer. His description on his Certificate of Medical Examination was height 5 feet 8 inches tall, weight 11 stone, with a medium complexion, grey eyes, and dark hair. His religious denomination was Presbyterian. He claimed that he had no previous military service. The Bathurst Times reported on 27th October 1915 that at Blayney (where the Coo-ees had stayed overnight the night before) ‘… as a result of a collection made amongst the people of Carcoar, Mandurama and Lyndhurst … the sum of £26 had been handed to Captain Hitchen as help to his men on their way to the front’, and that ‘They had also brought along a recruit in the person of Mr. George Ewins [sic], of Mandurama’. There is an irregularity in his service record, which perhaps indicates that some of his initial paperwork may have been lost. His Statement of Service is recorded as having commenced on 28th October 1915 (when the Coo-ees were at Bathurst). He completed his Certificate of Medical Examination at Liverpool on 23rd November 1915. The Oath in his Attestation Paper was dated 28th October 1915, and recorded as ‘taken and subscribed at Bathurst’, but it was not signed by an Attesting Officer until 6th January 1916. On his embarkation roll his address at time of enrolment was Cathcart, Mandurama, N.S.W., and his next of kin was his father, J. B. [James Bell] Ewens, at the same address. His date of joining on this document was 26th October 1915 (the day the Coo-ees stayed overnight at Blayney). 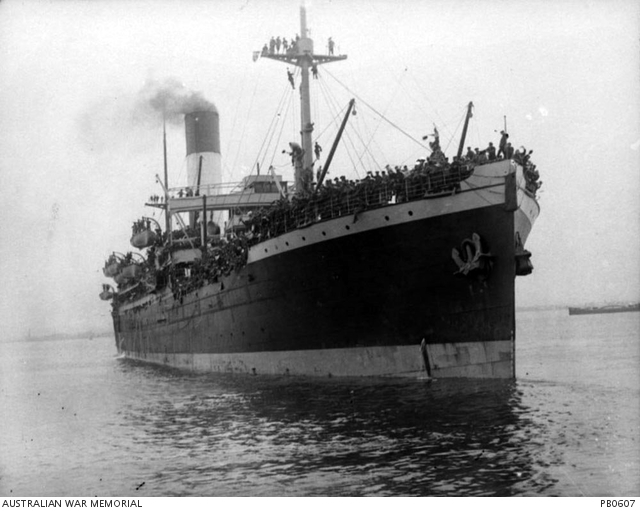 On 8th March 1916 Private Ewens, along with many of the other Coo-ees, departed Sydney on the HMAT A15 Star of England, as 15th reinforcements for the 13th Battalion, and arrived in Egypt on the 11th April 1916. He was transferred to the 45th Battalion on 19th April 1916. On 2nd June 1916 Private Ewens left Alexandria aboard the transport Kinfauns Castle, bound for France. He arrived at Marseilles on 8th June 1916. Private Ewens served with the 45th Battalion through its first action at Fleurbaix, France, in July 1916 then as it moved to Pozieres in early August 1916. On 30th August 1916 the 45th Battalion was in the front line trenches between Pozieres and Mouquet Farm in France. The Battalion had casualties of 1 man killed and 4 wounded. Private Ewens was one of the wounded, suffering gunshot wounds to his back and leg. (Fellow Coo-ee Private Healey was evacuated with shell shock on the same day). Private Ewens was evacuated to the 44th Casualty Clearing Station, then admitted to the 13th General Hospital at Boulogne, France, the next day, on 31st August 1916. On 2nd September 1916 Private Ewens was transferred to England aboard the Hospital Ship Newhaven, and admitted to the 2nd Eastern General Hospital in Brighton, England. On 6th October 1916 he was discharged from hospital, and sent to the Number 1 Command Depot at Perham Downs, England. On 8th October 1916 Private Ewens was granted leave, to report back on 25th October 1916. On 27th October 1916 he marched out the Command Depot at Wareham. On 11th November 1916 Private Ewens departed England to return to France. He marched into the 4th Australian Division Base Depot at Etaples, France, on 13th November 1916. He rejoined the 45th Battalion on 4th December 1916, when it was resting at Dernacourt, France. On 23th February 1917 the 45th Battalion was in action near Guedecourt, France, when Private Ewens was wounded in action for the second time, receiving a gunshot wound to his left hand. He was evacuated to a Casualty Clearing Station, then on 25th February 1917 he was placed aboard the 21st Ambulance Train. He was moved to the 10th General Hospital at Rouen, France, where he was admitted on 26th February 1917. On 3th March 1917 Private Ewens was transferred to the 2nd Convalescent Depot also at Rouen, France. On 29th March 1917 he was transferred to the 4th Australian Division Base Depot at Etaples, France. Private Ewens rejoined the 45th Battalion on 19th April 1917, when it was training at Bresle, France. On 7th June 1917 the 45th Battalion was in action at Messines, Belgium, when Private Ewens was wounded in action for a third time, receiving a gunshot wound to his groin. He was evacuated to the 77th Field Ambulance. On 8th June 1917 he was sent to the 53rd Casualty Clearing Station. On 9th June 1917 he was moved back to the 4th General Hospital. On 18th of June 1917 Private Ewens was placed aboard the Hospital Ship Newhaven at Calais, France, for evacuation to England. He was admitted to the 3rd London General Hospital at Wandsworth on the same day. The Evening News reported on 20th September 1917 (with an accompanying photograph) that ‘Mr Ewens, a farmer, of Mandurama, has received word that his son, Private George Ewens, who enlisted with the Coo-ees, was wounded for the third time at Messines … Private Ewens is now in hospital in England’. On 8th October 1917 Private Ewens was transferred to the 3rd Australian Auxiliary Hospital at Dartford, England. On 12th October 1917 he was discharged to Depot at Weymouth. Private Ewens left England on 5th November 1917, for return to Australia aboard the H.M.A.T. Themistocles. He arrived in Australia on 3rd January 1918, and was discharged medically unfit on 4th March 1918. Per his military service record (regimental no. 4728), Louis Henry Attenborough was born at Stratton Audley, Oxford, [England]. He gave his age as 44 years and 6 months, his marital status as single, and his occupation as mechanic. His description on his certificate of medical examination was height 5 feet 8 inches tall, weight 10 stone 10 lbs., with a fresh complexion, grey eyes, and hair ‘going grey’. His religious denomination was ‘Free Thinker’. He claimed that he had no previous military service. His ‘Joined on’ date was recorded as 27th October 1915. Louis Attenborough was named in an article titled ‘Blayney recruits’ in The Leader as one of six men who have joined ‘as a result of the visit of the Coo-ees to Blayney’. The Coo-ees had held a recruiting meeting and stayed overnight at Blayney on 26th October 1915. He was attested by Captain Eade at Bathampton on 27th October 1915, where the Coo-ees stayed that evening, after leaving Blayney that morning. He did not complete his medical examination until 13th November 1915, at Liverpool Camp. On his embarkation roll his name was recorded as ‘Lewis Henry Attenborough’, and his address at time of enrolment was Blayney, N.S.W. His next of kin was listed as his brother, A. W. [Arthur] Attenborough, Alagallah, Bowral Street, Kensington, N.S.W. His religion was recorded on this document as Church of England. On 8th March 1916 Private Attenborough, along with many of the other Coo-ees, departed Sydney on the HMAT A15 Star of England, and arrived in Egypt on the 11th April 1916. On 16th April 1916 Private Attenborough, along with some of the other Coo-ees, was transferred to the 4th Pioneer Battalion at Tel-el-Kebir. On 4th June 1916 Private Attenborough left Alexandria aboard the Transport Scotian, bound for France. He arrived at Marseilles on 11th June 1916. Private Attenborough served with the 4th Pioneer Battalion in France for the next six months, until on 9th December 1916, when he was sent to the 5th Australian Field Ambulance sick with Influenza. On 10th December 1916 he was moved back to the 38th Casualty Clearing Station. On 11th December 1916 he was placed aboard the 5th Ambulance Train, for transfer to the 9th General Hospital at Rouen, France. On 24th December 1916 he was placed aboard the Hospital Ship Dunluce Castle at Le Harve, France, for evacuation to England, with Debility. Later that day he was admitted to the Cambridge Hospital at Aldershot, England. On 18th January 1917 Private Attenborough was granted leave, to report to the No. 1 Command Depot at Pernham Downs, England, on the 2nd of February 1917. On 7th February 1917 Private Attenborough went before a Medical Board, where he was found to have Deafness, Senility and Rheumatism, and to be overage – he was recorded as being “58” years of age at his ‘last birthday’ on a Medical Report on an Invalid form in his service record. [If this stated age was actually correct, this may have made him the oldest Coo-ee to go overseas on active service]. Stated on the Medical Report on an Invalid dated 7th February 1917 in his service record was: ‘Has been somewhat deaf for years but in August while passing one of our own guns was deafened by its firing’. On 12th February 1917 he was transferred to the No. 2 Command Depot at Weymouth, England. On 6th April he marched out from No. 2 Command Depot at Weymouth for return to Australia. On 4th May 1917 Private Attenborough departed England from Plymouth aboard the H.T. Themistocles for discharge. (Also being sent home on the same ship were Coo-ees James Birrell Dawson, Walter James Goodlet, and James McKeown). Private Attenborough arrived in Sydney on 5th July 1917. He was discharged medically unfit on 23rd August 1917. Note: A letter in his service record dated 8th April 1921 shows that Louis Henry Attenborough had returned to England by this date, as it reported he was at that time residing at Fern Cottage, 90 Bath Road, Heston-Hounslow, Middlesex. Per his military service record (Depot), Thomas Anderson was born at Redfern, N.S.W. He gave his age as 34 years and 6 months, his marital status as single, and his occupation as labourer. His description on his medical was height 5 feet and 8 inches tall, weight 154 lbs., with a fair complexion,[grey eyes], and brown hair. His religious denomination was Roman Catholic. He claimed that he had no previous military service. He gave his address as Roslyn Street, Mascot, N.S.W., on his initial Application to enlist in the Australian Imperial Force form. He completed his medical on the 25th October 1915 at Wellington (7 days after the Coo-ees left), then travelled to catch up with the Coo-ees at Blayney, and was attested by Captain Eade at Blayney on 26th October 1916. On 7th December 1915 Private Anderson, with fellow Coo-ee Private Denmead, while under the influence of liquor, were charged with begging alms in Campbell Street, Sydney, after they had ‘asked a military police officer for a “sprat” to get a drink’. Along with Private Denmead, he appeared before the Central Police Court, and was sentenced to one hour’s imprisonment. Private Anderson was charged with being absent without leave from 1st December 1915 to 12th December 1915, and as a result, on 14th December 1915 he was discharged as not likely to become an efficient soldier. On 24th April 1916 Thomas Anderson re-enlisted at Bathurst, where he gave his occupation as miner, and went into Depot Camp at Bathurst. He was transferred to the 53rd Battalion on 26th April 1916. 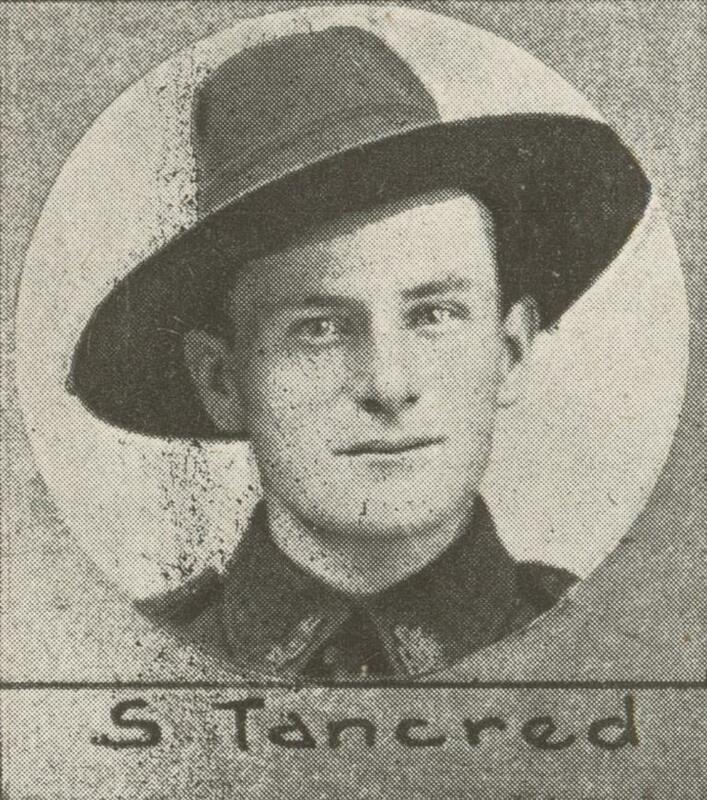 On 5th July 1916 he transferred to the Trench Mortar Battery at Menangle Park. On his embarkation roll his address at time of enrolment was Portland, N.S.W., and his next of kin was listed his sister, Mrs M. Cox, Roslyn Street, Mascot, Sydney, N.S.W. ON 7th November 1916 Private Anderson embarked from Sydney with the 2nd reinforcements for the Light Trench Mortar Battery on the HMAT Ceramic A40, with regimental no. 1190. He disembarked at Plymouth in England on 21 November 1916 for further training. On 7th February 1917 he marched into the 4th Training Battalion at Codford in England. On the 22nd February 1917 Private Anderson was taken on strength of the 13th Battalion. On 27th February 1917 Private Anderson proceeded overseas from Folkstone to France, to reinforce the 13th Battalion. On 1st March 1917 Private Anderson marched into the 4th Australian Division Base Depot at Etaples in France. On 5th March 1917 he marched out of the 4th Australian Division Base Depot to join the 13th Battalion. On 6th March 1917 Private Anderson was taken on strength of the 13th Battalion whilst it was training at Ribemont in France. Just over a month later, on 11th April 1917, the 13th Battalion was involved in an attack on the Hindenburg Line. During this attack Private Anderson was wounded in action, receiving a gunshot wound to his right hand. Private Anderson was evacuated to the 56th Casualty Clearing Station, then placed aboard the 11th Ambulance Train. On 13th April 1917 he was admitted to the 1st General Hospital. On 19th April 1917 Private Anderson was placed aboard the Hospital Ship Londonderry at Rouen for evacuation to England. On 20th April 1917 he was admitted to the 1st Southern General Hospital at Birmingham, England. On 12th June 1917 Private Anderson was discharged from hospital, and granted leave to report to the Number One Command Depot at Pernham Downs in England on 16th June 1917. On 30th June 1917 Private Anderson was charged with being absent without leave from 3.30 pm on 26th June 917 until 8.20 pm on 27th June 1917. He was forfeited two days pay. On 30th July 1917 Private Anderson was attached to the 9th Training Battalion at Durrington in England. On 7th January 1918 Private Anderson was sent to the Number Two Command Depot at Weymouth in England. On 10th March 1918 Private Anderson departed England to commence his return to Australia aboard the Durham Castle for discharge with ankylosis in his right thumb. His ship stopped at Cape Town in South Africa. On 30th April 1918 he was charged at Cape Town with (1) Conduct to the prejudice of good order and military discipline in that he failed to be on board HT Orontes at sailing time 2 pm, the draft to which he belonged having embarked at 10.30 am, and (2) being absent without leave from 2 pm on 19th April 1918 until 8 pm on 21st April 1918, when he reported back. He was awarded 168 hours detention and fined 31 days pay. He also was absent without leave from 10 pm on 29th April 1918 to 4.30 pm on 3rd May 1918, and his sentence of 168 hours for this offence was concurrent with his awarded detention on 22nd April 1918. On 4th May 1918 Private Anderson departed Cape Town aboard the HT Borda bound for Australia. He arrived in Sydney on 1st June 1918, and was discharged medically unfit on 5th July 1918. Per his military service record (regimental no. 5089), William Henry Griffiths was born at Waterloo Flat, Victoria. He gave his age as 33 years and 2 months, his marital status as single, and his occupation as engine driver. His description on his medical was height 5 feet 7 inches tall, weight 9 stone 10 lbs., with a fair complexion, hazel eyes, and auburn (dark) hair. His religious denomination was Roman Catholic. He claimed that he had no previous military service. William Griffiths was named in an article titled ‘Blayney recruits’ in the Leader as one of six men who have joined ‘as a result of the visit of the Coo-ees to Blayney’. The Coo-ees had held a recruiting meeting and stayed overnight at Blayney on 26th October 1915. He completed his medical examination at Orange on 1st November 1915, and was attested at at Orange on the same day. On 18th February 1916 he was charged with being absent without leave for two days, and he was fined ten shillings. On 21st February 1916 he was charged with being absent from parade, and he was fined five shillings. On his embarkation roll his address at time of enrolment was 2 Hambleton Street, Albert Park, Melbourne, Victoria, and his next of kin was listed as his father, E. R. Griffiths, at the same address. An initial Regimental No. 4784 is crossed out on his Attestation Paper, and replaced with 5089. Private Griffiths departed Sydney on the HMAT A16 Star of Victoria A16 on 31st March 1916 with two other Coo-ees, as 16th reinforcements for the 13th Battalion. He arrived in Egypt on the 8th May 1916. On 7th June 1916 Private Griffiths left Alexandria aboard a transport ship bound for France, and he arrived at Marseilles on 14th June 1916. He was sent to the 4th Division Base Depot at Etaples, France. He marched in and was taken on strength of the 13th Battalion on 21st July 1916, when it was training at Naours, France. On 21st August 1916 Private Griffiths was sent to the 3rd Canadian General Hospital at Boulogne, France, suffering Nephrites. On 25th August 1916 he was evacuated to England aboard the Hospital Ship Brighton. Later that day he was admitted to the Guildford War Hospital at Guildford, England. On 20th November 1916 he was transferred to the 1st Australian Auxiliary Hospital at Harefield, England. On 2nd December 1916 he was discharged from Hospital, and sent to the Number 2 Command Depot at Weymouth, England. On 2nd January 1917 Private Griffiths was sent to the Infantry Drafting Depot at Pernham Downs, England. On 22nd July 1917 he departed Southampton, bound for France. He arrived at the 4th Australian Division Base Depot on 24th July 1917. He departed the 4th Australian Division Base Depot on the 9th of August 1917, and rejoined the 13th Battalion on 11th August 1917, when it was conducting working parties in the vicinity of Neuve Eglise, Belgium. On 25th September 1917 the 13th Battalion was manning the front line trenches in the vicinity of Westhoek, Belgium, when Private Griffiths was wounded in action, receiving a shrapnel wound to his chest. He was moved back to the 3rd Australian Field Ambulance. On 27th September 1917 he was moved to the 3rd Casualty Clearing Station, where he was placed aboard the 24th Ambulance Train, and moved to the 7th Canadian General Hospital at Etaples, France. On 10th October 1917 he was placed aboard the hospital Ship Lille De Liege and evacuated to England. He was admitted to the Royal Surrey War Hospital at Guildford in England later that day. Private Griffiths was discharged from hospital on 29th November 1917, and granted leave to report to the Number 1 Command Depot at Sutton Veny on the 13th of December 1917. On 18th January 1918 Private Griffiths was admitted to the Sutton Veny Military Hospital, suffering Bronchitis. He was discharged and sent back to the Number 1 Command Depot on 12th February 1918. On 16th March 1918 Private Griffiths was transferred to the Australian Motor Transport Service as a cleaner. His service record includes a certified extract of a marriage certificate for a marriage on 21st August 1918 between William Henry Griffiths (soldier) and Kathleen Spires at Christ Church, Chelsea, England. On 31st January 1919 Private Griffiths marched into the Number 2 Command Depot at Weymouth, England, to commence his return to Australia. On 5th February 1919 he was transferred to the Number 1 Command Depot at Sutton Veny, England. Private Griffiths departed England on 2nd April 1919 for return to Australia with his wife, aboard the H.T. Benalla. He arrived in Australia on 5th May 1919. He was discharged medically unfit on 15th November 1919.